लावण्यम्` ~अन्तर्मन्`: Rajesh Khanna & The Air of Time"
Rajesh Khanna & The Air of Time"
The house in this Sikh holy city's Gali Tiwaria was donated by Rajesh and a temple was constructed several years ago. 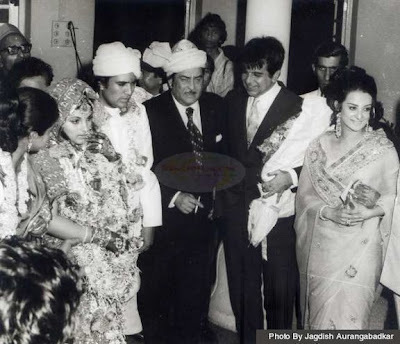 Born Jatin Arora on Dec 29, 1942, he was adopted and raised by Shri Chunni Lal Khanna and his wife Leela Devi. They became Jatin's foster parents. They were relatives of his biological parents. When Jatin arrived in Mumbai, they lived in an area called ' Thakurdwar ' which is near Girgaon, in Mumbi, Maharastra state in INDIA. He went from being Jatin to Rajesh, thanks to his uncle who changed his name, when he decided to join films. Rajesh Khanna was selected through a talent hunt organized by Filmfare and United Producers in 1965. This was long before television was popular in India - forget reality television. He made his debut with "Aakhri Khat" in 1966. He was affectionately called " KAKA " also - ' RK' or " Rajesh Khanna "
He appeared as a Leading man - Hero, in about 160 films, of which 106 had him as the solo lead hero and 22 were two hero projects. Among them are ..
Rajesh Khanna was the first Bollywood actor for whom the term 'superstar' was coined. He made a comeback in Aa Ab Laut Chalen (1999) and Kyaa Dil Ne Kahaa (2002) and played the solo lead in films Sautela Bhai in 1996. Pyar Zindagi Hai in 2001 and Wafaa in 2008. He did 4 television serials in the period 2000-2009.
began in November 2008 and ended in September 2009. 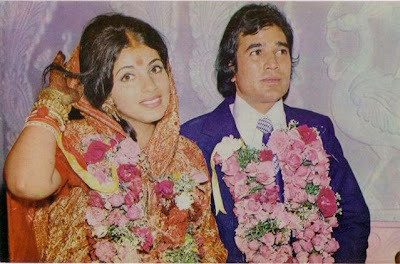 Rajesh Khanna dated actress Anju Mahendru for around seven years. They broke up in 1972,Rajesh Khanna dated actress Anju Mahendru for around seven years. they have 2 lovely daughters named Twinkle Rinkie but RK & Dimple, separated in 1984. During the 80's actress Tina Munim was Rajesh Khanna's constant companion. Rajesh Khanna was a member of Parliament for the Congress Party, from the New Delhi constituency, where he won the 1992 by-election, retaining his seat until the 1996 election. Khanna was a life member of the International Film And Television Research Centre, the International Film And Television Club and the Asian Academy of Film & Television. On 10 April 1999 Khanna inaugurated the live concert of S.P. personal memory of " KAKA " related info. Though I've only seen seen heartthrob "R. K" in Filmi functions etc I did not meet him personally . The memory I share today is about his cousin brother YASH - who often visited his Dost across from papaji's home & soon he invited us to see the Fabulous home of Rajesh Khanna called " Aasheerwaad " @ Carter Rd Bandra, Mumbai. Yash regaled us with stories of his famous STAR brother and i recall us visiting Rajesh Khanna's home along with my sisters & my amma Susheela. Yash showed us RK's lovely home filled with carved wooden furniture and we peeked into Kaka's wardrobe which had rainbow colored Silk & cotton Kurtas & lungis & other attire , all hanging neatly in his cupboard. We also found out a rare fact that ' KAKA' loved a French Perfume / cologne named Nina Ricci ! 1949, It means "Air of Time"
वो ही तो अदाकारी का परचम लहराये ……नमन ! मन विचलित है अब भी!